Mathematical Games and Pastimes focuses on numerical solutions to mathematical games and pastimes. The book first discusses the binary system of notation and the system of notation with the base three. 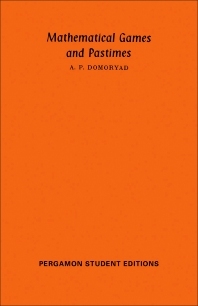 Congruences, Pythagorean and Heronic triples, and arithmetical pastimes are explained. The text takes a look at the nature of numerical tricks. Guessing the results of operations with unknown numbers; determination of numbers thought of using three tables; and extraction of roots of multidigit numbers are explained. The selection also touches on rapid calculations, games with piles of objects, Meleda, solitaire, and Lucas’ game. Problems on determining ways to reach goals are also presented. Games that show the numerous ways to reach goals are discussed. The text also examines Euler squares, dominoes, and problems related to the chess board. Pastimes related to objects changing places are also highlighted. Topics include Lucas’ problem, Ruma, and Monge’s shuffle. The book is highly recommended for readers wanting to find solutions to mathematical games and pastimes.